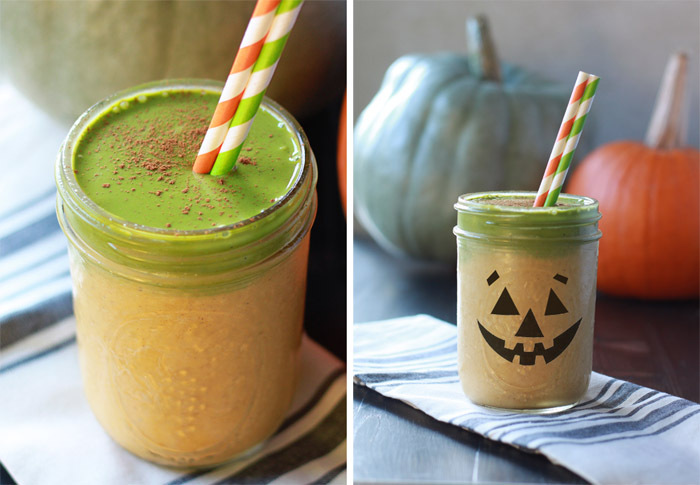 These rich and creamy cashew-based, dairy-free smoothies taste just like pumpkin pie, whether you go green or stay orange. 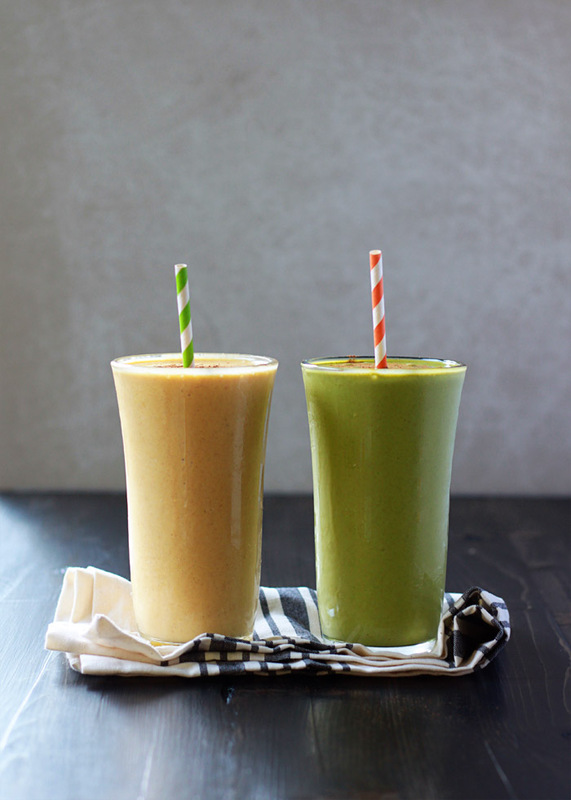 I’m pretty obsessed with this smoothie formula right now, so I hope you’ll bear with me as I throw another variation your way. Or two. 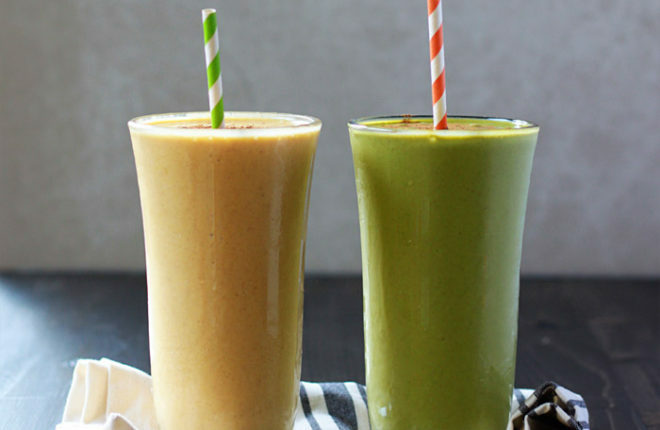 Basically, the creamy base of the smoothie is made of cashews, water, and banana. I had no idea that raw cashews could make smoothies so utterly rich and creamy until, this summer, my obsession with these began. Ohmygoodness. Basically, you throw it all in the blender and the nuts and water start to puree and you’re looking it going all, “what have I DONE here?” And then, all of the sudden, it just goes all creamy and blissful. I just love that these are vegan yet uber creamy without having to rely on some sort of milk to make it happen. Aside from the cashews, water, and banana, the basic formula also has ice cubes, pure maple syrup, a splash of vanilla, and a pinch of salt. From there, it wasn’t too much farther to pumpkin town. And then on to its close neighbor, green pumpkin town. Pumpkin puree, pumpkin spices, and a dusting of cinnamon, and you’re in pure pumpkin-pie-esque heaven. For a hit of nutrients, throw a few spinach leaves in there. Sure, you lose that familiar orange hue, but the flavor stays the same. Go forth and greenify. Or not. Your choice! 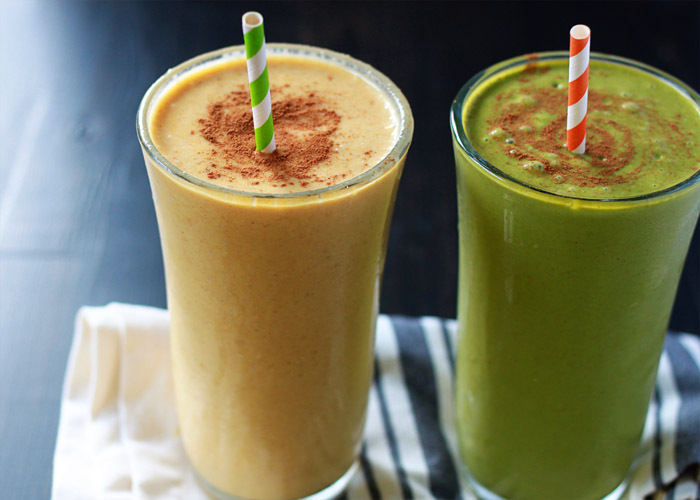 Add all ingredients to the pitcher of a blender. Puree at medium speed until smooth, then increase speed to high and blend until creamy, 30 seconds to 1 minute more. Pour into a glass and dust with cinnamon, if desired. Serve. 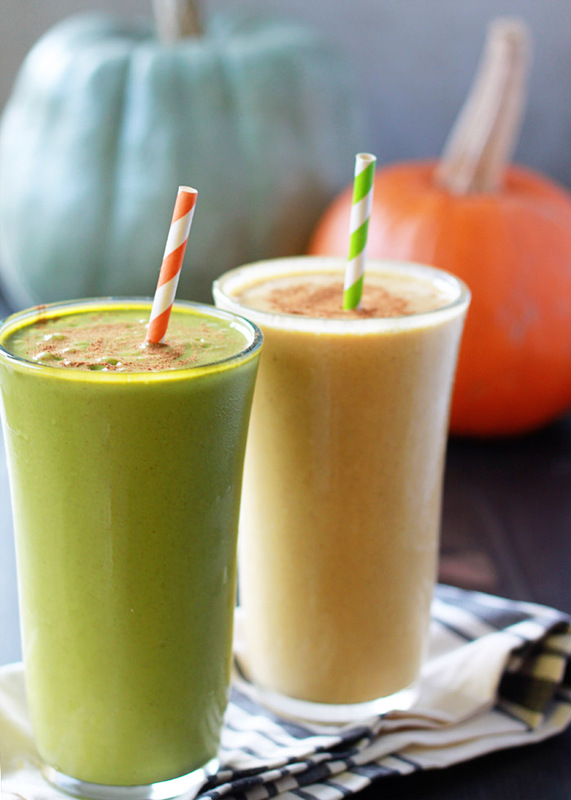 Oh my gosh, love the layered smoothie. It DOES look just like a pumpkin. So festive! 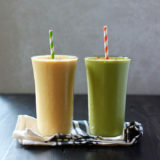 Yum these smoothies look absolutely delicious!!! Need to try this soon. Pinned!